Does unique hotel design help you decide where to stay? For many travellers, a beautiful interior is just as important as a room with a view. A fabulous space can affect your whole mood and alter your whole travel experience from unmemorable to unforgettable. When I wrote the Contemporary Asian Home series of interior design books, showcasing contemporary Asian interior design trends, many of those books’ interiors were sourced from Asia’ top boutique hotels. In Asia, hotel design is the best showcase for new and creative design trends, because unlike private homes, hotels are public spaces where the general public can see and experience new style concepts, and then filter them into their home spaces. A multitude of cool and funky design hotels abound around Asia, with newer ones coming out all the time. Here’s a glimpse inside some memorable boutique design hotels around Southeast Asia, suggested by Jacada Travel , a bespoke luxury travel company based in Hong Kong and London. 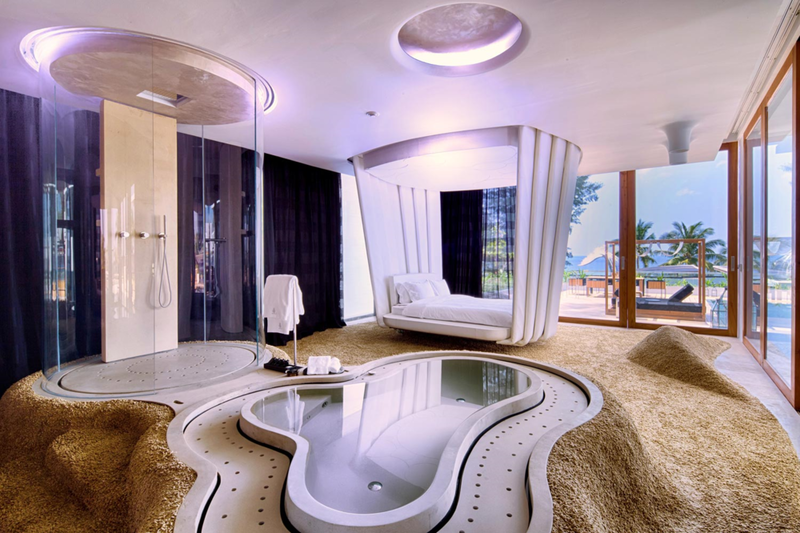 This funky, art inspired boutique hotel was designed by White Jacket design studio, with state-of-the-art amenities and luxury facilities like a groovy rooftop pool and bar. Unique rooms add an extra allure for style-hunters, with a Coco Chanel-inspired theme room and an Andy Warhol-inspired pop art room. I was always intrigued by Alila Uluwatu’s stunning signature photo of their cliff top infinity pool with this mysterious cage structure hovering dramatically on the side. it’s a box to contain weddings! I’m not sure if this is a symbol of entering into married life, but never mind. This is the most stylish cage, oops I mean fantasy poolside cabana I’ve ever seen. The hotel design features locally sourced and sustainable materials, such as flat lava rocks and bamboo, integrate cutting-edge design into panoramic sea views. The guest rooms are fabulous open-plan pool villas. Move over, Maldives. You can now find private-island-over-water-villas in…Cambodia! (yes, Cambodia. Who would have guessed it?). Co-founder, interior designer and organic sculpture artist Melita Hunter harmonises the interiors with their surroundings, making the most of each island’s natural beauty. As well as a strong conservation ethic, the resort places a focus on community development through a series of projects. I’m no Gordon Gecko, which is why I say Green is Good in Asian financial hub Hong Kong. Nature and sustainability are a major focus here, with a vertical garden that consists of over 8,000 plants encompassing 71 species. Sculpted wooden furniture and artist installations give the hotel its unique edge. The hotel was created by a team of well-known architects and interior designers, including the acclaimed designer Terence Conran, and one of Hong Kong’s most prominent design architects, Roco Yim. It’s all Spartan glamour with sleek, geometric lines, bare surfaces and hushed ivory tones here. This is a place where you’d want to wear a white Jil Sander buttonless, pocketless, waistless, minimal suit, glue your hair into a flat ponytail, and leave your Marc Jacobs floral boho smock and Prada fringe bag at home. A secret garden on the sixth floor offers guests a green space in which to recharge from city exploration, as well as the ideal setting for complimentary morning yoga classes that take place each weekend. When designing the property, architect Andre Fu focused on natural materials and use of light throughout the spacious interiors, with a selection of artworks and sculptures on display to compliment the sleek interior. My dream beach villa looks quite different from this, but “chacun a son gout”, the French say. Or, in this case – to many people, their many different tastes. 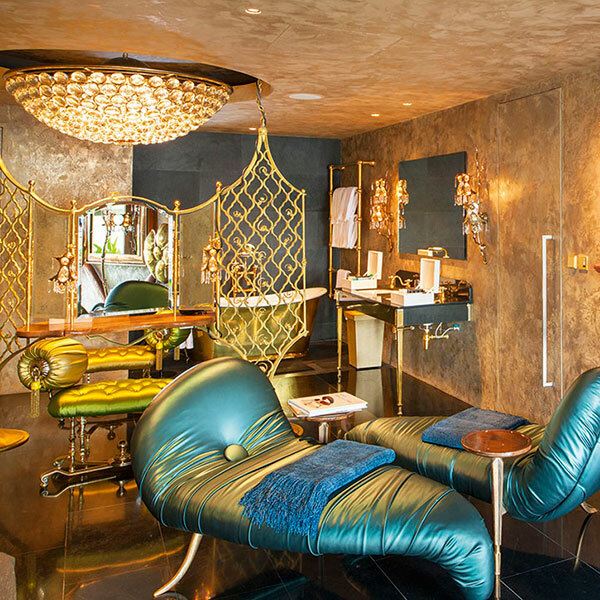 The owner commissioned a different designer to design each room, resulting in a different style in each room, embodying extravagant contemporary design and opulence, wild wanderings of the imagination, and no holds barred indulgences. Villa Siam showcases Thai art and design, Villa Bianca uses white furniture and natural materials as a canvas for Asian art, and Collector’s Villa is a collaboration between Jaime Hayon, Joseph Walsh, Mark Brazier-Jones and the Campana brothers encompassing each of their unique styles. Which style suits your preference? It doesn’t matter. The fabulous thing about hotels is that you can check in and check out whenever you like. Great to see upper house on the list. Have you checked out Temple House in Chengdu?